Who: Lincoln Center President Debora L. Spar; comedian, actress, and jazz musician Lea DeLaria; Sugartone Brass Band, a New Orleans–style second-line brass band; DJs Leigh Lezark, Geordon Nicol of The Misshapes; New York City–based artist collective WAFFLE; pianist Isaiah Thompson; dancer and choreographer Preeti Vasudevan; and violinist Filip Pogady. What: The Lincoln Center Young Patrons are summoning the Roaring ’20s with a two-tiered gala inside one of Brooklyn’s architectural treasures: the Weylin. For one night only, what you may know as the historic Williamsburg Savings Bank will be transformed, with a swank speakeasy downstairs and a music-fueled party overhead—all designed to transport guests back to the Jazz Age. Lincoln Center Young Patrons connects culturally minded New Yorkers in their 20s and 30s who celebrate, support, and promote the world’s leading performing arts center: Lincoln Center for the Performing Arts. 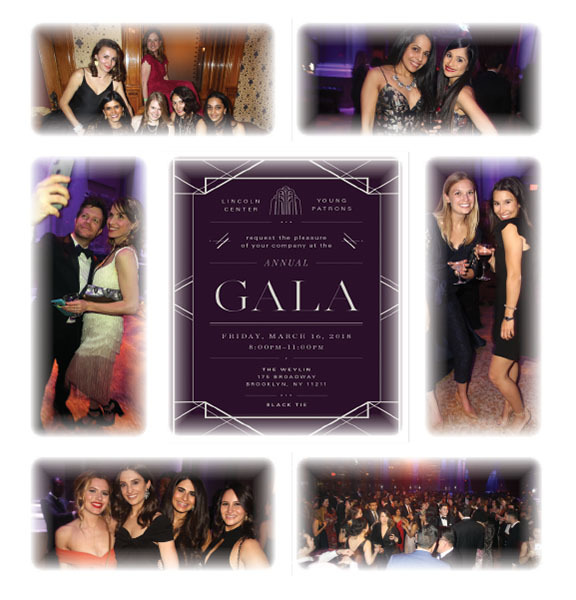 Funds raised from the Young Patrons Gala support Lincoln Center’s arts education and audience development initiatives. Special support for the Lincoln Center Young Patrons Gala is provided by Lita Tandon and The Tandon Family. Additional support for the Lincoln Center Young Patrons Gala is provided by Jennie L. and Richard K. DeScherer and Hearst. Lincoln Center Young Patrons thanks its lead sponsor First Republic Bank. Additional support for the Lincoln Center Young Patrons is provided by Focus Financial Partners. Generous support for the Lincoln Center Young Patrons is provided by Founding Fund members Noreen Ahmad, Hannah Bronfman and Brendan Fallis, Harold Burson, Shirley Chen and Nicholas Haslett, Juliette Cho and Peter Kim, Josh Elkes, Sarah Elkes, Anuj Gupta, Jason Paez, Sarah Seo and Mike Park, Shiv Sethi, Lita Tandon, Jacqueline Truong, and Kevin Zhu.